Since fire was first discovered during the Stone Age, the creation of fireplaces and advances in technology have enabled us to enjoy the benefits of fire safely in our homes. What was once considered primarily a source of heat to cook food on, the use of fire has since become a stylish focal feature in a home. 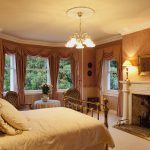 Here, we will briefly guide you through the history of fireplaces and how the functionality and style of fireplace designs have changed throughout the years. The discovery of fire during the Stone Age was a pivotal point in human history, as the ability to start and control fire played a major part in human evolution. Ancient fireplaces were located in areas where a fire could be started and contained to ensure complete safety in a controlled environment. During 500 BC, the Celts created fire pits in the centre of their small huts to emit heat, with smoke escaping through a hole in the roof. The Roman Era saw a significant advancement in fireplace design as the Romans started to use portable hearths to hold and carry fires from room to room, similar to modern heaters. Fireplaces reverted back to the early stages of their design following the fall of the Roman Empire, with English peasants using central fire pits in their huts for cooking and warmth. Similar to the technique used by the Celts, smoke was expelled through a hole in the roof when the fire was in use. The introduction of two-story houses opened doors to new fireplace technology; fire pits were replaced with fireplaces which were moved to the outside wall. In turn, chimneys were invented to create a draft and expel the smoke up and out of the building, which gave people the option of having a fireplace on different floors. 1678 saw the invention of the fireplace grate by Prince Rupert of the Rhine. He discovered that elevating the frame used for holding firewood allowed for better air circulation underneath it which, in turn, helped fuel the fire and increase its efficiency. 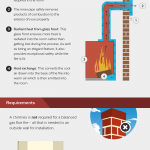 The invention of the Pennsylvania Fireplace by Benjamin Franklin in 1742 was groundbreaking. Franklin created a freestanding cast iron stove which was designed to double the heat output whilst using a quarter of the fuel. 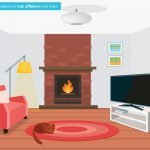 Not only did this improve the safety of having a fire in the home, but it also increased the overall heating efficiency. Following this, in 1796 Count Rumford designed a fireplace which incorporated a tall, shallow firebox. Its simple yet revolutionary design was far more efficient at burning wood and expelling smoke. During the 1900s, emphasis shifted from using fireplaces as a source of heat to their stylish design. In 1968, the first suspended, 360 degrees pivoting fireplace was invented which paved the way for more innovative designs. 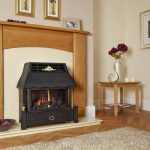 From the 1980s onwards, homeowners started looking for more environmentally friendly, cost-effective fireplace options. The popularity of wood burning stoves and pellet appliances grew, as more and more people wanted sustainable ways of generating the most heat for the least amount of money. 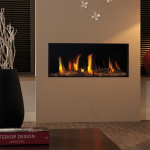 During the 1980’s and 90’s, there was a huge development in the design of both living flame and flame effect gas fires. As technology progressed, this saw major improvements in the safety, energy consumption and overall efficiency of gas fires which, in turn, increased their usability. 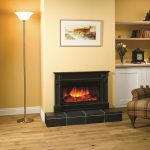 In 1995, the first electric fireplace was introduced, which created the ambiance of an authentic wood burning flame effect without any toxic greenhouse gas emissions or mess. 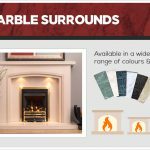 Whether you are looking to replace your existing fireplace with a modern design, or are buying a brand new fireplace for the first time, don’t hesitate to get in touch with the experts here at The Fireplace Studio today. Simply give us a call to talk to one of our team or visit our showroom to view our designs first-hand.